1886 was a pivotal year in the evolution of personal transport. Not only was it an important year for bicycle patents, but the first car was patented too, on 29th January, 1886. This was Karl Benz’s Benz Patent Motorwagen, the world’s first successful petrol-powered car. 1886 was the first year of cross-frame safeties and this bicycle is delightfully basic. You can see H.J Pausey’s 1885 patent below. Herbert Pausey manufactured ordinaries between 1879 and 1886 and, from around 1887 he traded as Pausey & Co at 52 Park Rd, Clapham. He patented a number of innovative devices, including a bicycle that could be converted into a tandem. One of his 1885 Pioneer Safety models had spring-loaded steering; another model was the ‘Pioneer Direct-Steerer Racer’ tricycle; while the 1886 ‘Pioneer Portable Direct-Steering Racer’ could be disassembled and packed into a canvas bag. His 1889 ‘Pioneer Safety’ had a divided diamond frame. Observe the centre steering, the same design used on Ordinaries (High Wheelers). When the first cross-frame safety bicycle was patented in February 1886 by Premier, other manufacturers quickly copied the design. The illustration below of Hillman, Herbert & Cooper’s ‘Premier Roadster’ is from the book Sturmey’s Indispensible of 1887. The essential difference between an Ordinary and a Safety is the bottom bracket, housing the pedal and chain mechanism and driving off the rear wheel instead of the direct drive of the Ordinary on the front wheel. At first this difference was described as ‘RD’ (rear drive of the Safety) or ‘FD’ (forward drive of the Ordinary). All bicycle manufacturers at this time made Ordinary bicycles. Of course, if they wanted to start making safety bicycles, they needed a bottom bracket, so they would have had to purchase a Premier (or one of the early copies) to see how to make it. Everything else could be used from an Ordinary, such as forks, handlebars, hubs (ie same as the Ordinary rear wheel). 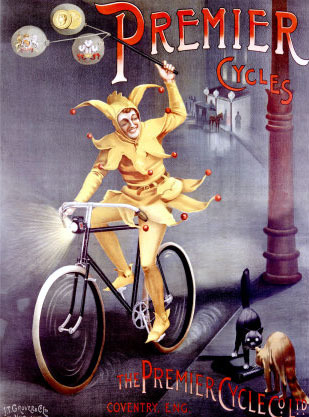 To start with, centre steering was used, though it does restrict the bicycle’s lock (turning circle). Safety bicycle design evolved fast and, within a year or so, centre steering had been dropped from most safety bicycles. The straight front fork on this bicycle is similar to the 1886 Ivel, below. The Ivel was the second cross-frame to be patented, in April 1886. Above, you can see the centre steering of an Ivel, which is different from this cross frame (below). The steering head on my bicycle would appear to be the of the Andrews or Hillman type, using plain bearings similar to those in the wheel spindles. Below, you can see a more advanced arrangement for steering heads, on the 1886 Royal Mail Ordinary. Royal Mail exclusively used the Trigwell’s Ball Bearing Head. Ball bearings were difficult to manufacture to a uniform size in the early years. This cross-frame has no struts or stays: more particularly, it has no visible remains of where they would attach to the frame. (You can see what I mean when you compare the Ivel and Premier illustrations). The lack of extra bracing is what defines this cross-frame bicycle as 1886. Within a year, manufacturers had decided that struts and stays were needed to strengthen frames. Chain-stays, seat stays and down-stays were added over the next few years to help triangulate the frames. By 1890, extra bracing had created triangulated and diamond frames for maximum strength. The other important factor in this early era of bicycle design was tube diameter. Over the next ten years it was increasingly better-produced and lighter. From 100 thou in 1886, tube was thinned down to around 60 thou by 1896. Helical tubing was patented in 1892, which meant that very much thinner tube could now be used. HELICAL TUBING: Compare cannon manufacture: a coil of steel was wrapped around the cannon barrel to stop it exploding; Premier used the same principle for cycle tubing. This bike is too early for ball bearings in the wheel hubs. Instead it has plain bearings, ie a male conical hub coming out of the axle with a female tapered insert on the wheel. When the bike was recently serviced, the tapers in the plain wheel bearings were removed and polished, then lapped into the wheels. These two photos illustrate the bike when I bought it. I’ve now replaced the saddle and pedals. The pedals are reproduction Rudge Ordinary pedals, and they are very well made. With other parts so similar to the Ordinary, pedals like these would have originally been used. One advantage of living in Sussex is the wealth of historic buildings all around. Photographing a bicycle as old as this requires a bit more forethought than usual, but the 14th century thatched timber-framed Clergy House at Alfriston provided an ideal backdrop. It’s very much the type of machine that would have been used by a local clergyman years after its manufacture. Alfriston Clergy House (pictured above in 1894) was the first house acquired by the National Trust, for the sum of £10, in 1896. Top photo of Alfriston Clergy House with thanks to the Society for the Protection of Ancient Buildings (founded in 1877).